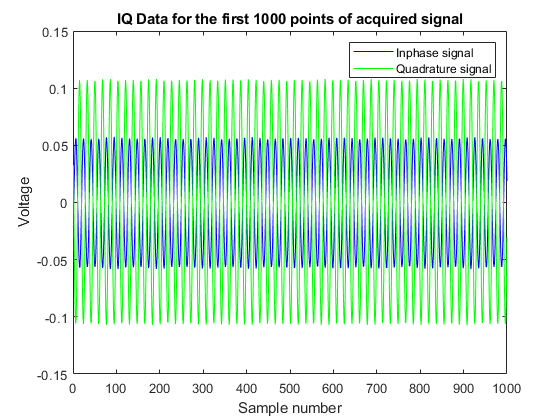 This example shows how to acquire IQ Data from a signal analyzer over a TCP/IP interface. Instrument Control Toolbox™ supports communication with instruments through interfaces and drivers. This example acquires IQ Data from a Keysight Technologies® (formerly Agilent Technologies®) X-Series Signal Analyzer (N9020A, MXA Signal Analyzer) over a TCP/IP interface. To run this example you need an X-Series Signal analyzer with an Ethernet (TCP/IP) connection. You can also execute this example with MATLAB on your X-Series analyzer, or on a PC on the same network as the X-Series Analyzer. This example uses functions from the Instrument Control Toolbox and the DSP System Toolbox™. Define the parameters used to configure the instrument before you make the measurement. Based on the signal you are measuring, you may need to modify some of the following parameters. Set up instrument connectivity using a TCP/IP connection. Adjust the input buffer size so that it can hold the data the instrument returns. Set the timeout to allow sufficient time for the measurement and transfer of data. Reset the instrument to a known state using the appropriate SCPI command. Query the instrument identity to make sure we are connected to the right instrument. The X-Series signal and spectrum analyzers perform IQ measurements as well as spectrum measurements. In this example, you acquire the time domain IQ data, visualize it in MATLAB, and perform signal analysis on the acquired data. Use SCPI commands to configure the instrument to make the measurement and define the format of the data transfer once the measurement it made. % Turn off electrical attenuation. Trigger the instrument to make the measurement, wait for the measurement operation to be complete and read in the waveform. Before you process the data, separate the I & the Q components from the interleaved data returned by the instrument and create a complex vector in MATLAB. % Separate the data and build the complex IQ vector. The instrument provides information about the most recently acquired data. Capture this information and display it. Plot the first 1000 points of acquired time domain data and annotate the figure. The spectrum view might have more information than the time domain view of the data. For example, you may use the spectrum view to identify the main frequency bands, the signal bandwidth, etc. 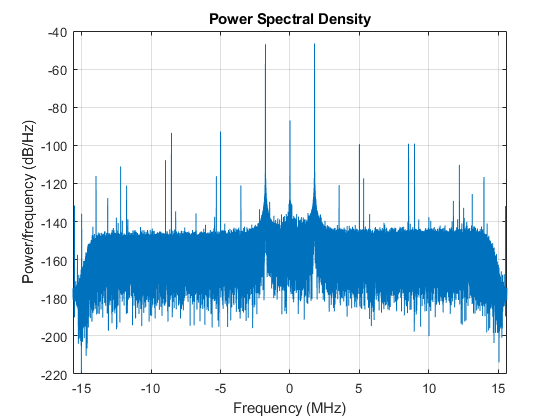 You need the DSP System Toolbox to plot the spectrum view. You may get errors if the required functionality is not available. Switch the instrument to spectrum analyzer mode and compare the spectrum view generated in MATLAB with the view on the Signal Analyzer. Use additional SCPI commands are used to configure the instrument measurement and display settings.